There are the jackpot houses. And then there are the don’t-get-jack houses. The worst are the ones where the residents are clearly home but just not answering the door. Trick-or-treating is a little bit of luck but a good part strategy. Some neighborhoods have a reputation for going all out. These yield the best candy-per-steps ratio. Before you head out, check out our list of the eight best trick-or-treating neighborhoods in Boulder County. If possible, take a cruise through town a day or so ahead of time, looking for the best decorations. Chances are, if someone is pouring hundreds of dollars and hours of time into their front porch, they won’t skimp on the candy bucket. Better yet is a highly decorated neighborhood with houses set close together. Although neighborhoods with signs of a lot of young kids may seem like a good choice, remember: These families will likely be out trick-or-treating at the same time, so they might not be home to hand out candy. Some may put buckets on their porches to take your own, but really, one greedy kid and everyone’s out of luck. For safety, don’t forget to select neighborhoods with good sidewalks, plenty of lighting and low crime rates. Here are our eight favorite places to trick-or-treat in Boulder County. Sometimes, the best places to trick-or-treat aren’t houses at all. 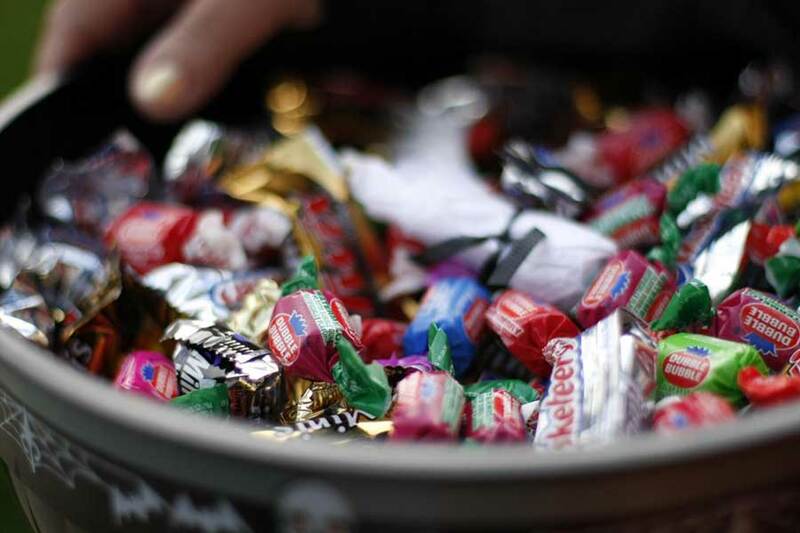 Businesses, downtown shopping areas, church groups and community parties are great places to easily score candy. 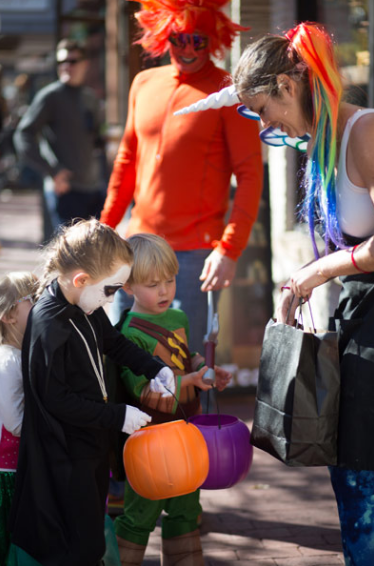 The Munchkin Masquerade, from 3-6 p.m. on Halloween, runs the length of the Pearl Street Mall and includes more than 100 businesses. 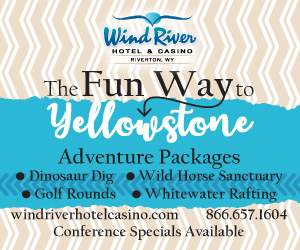 It’s free and fun, although it can get a bit rowdy and crowded. The World of Wonder Children’s Museum in Louisville also holds a Halloween party; Louisville organizes a Monster Dash on Oct. 29 (make your little zombies run for their candy, given at the end); and downtown Longmont has a parade and Trick or Treat Street on Oct. 28. Anyone is welcome to join the foot parade (just line up at 9:30 a.m. in front of the St. Vrain Memorial Building), and afterward, hit up the businesses that will be passing out treats. Also in Longmont, the Village at the Peaks shopping area does a Spooky Village Halloween on Oct. 28. The free event is billed as “safe trick-or-treating” and also includes a unicorn carousel, goblin train rides, dancing, food, crafts (like pumpkin decorating) and more. Just outside of Boulder County, the Broomfield Spooktacular on Oct. 28 at the Broomfield Community Center includes games, jumpy castles, wagon rides and plenty of trick-or-treating. Stray just north of the Pearl Street Mall for some awesome decorations and ample candy distribution. The Mapleton Hill neighborhood is known for its Halloween spirit. Best of all, in the past, one house has handed out margaritas to the parents. You’ll have to knock on all the doors to find out which one, but it’s a treat worth working for. Also check out the area of West Pearl, Spruce Street and Ninth Street. It’s just a bit beyond the mall, so it’s less crowded but you still get to enjoy the excited energy. Longmont’s old town tends to be a great Halloween hotspot. Historic houses are close together, many pockets are amply decorated and you have a mixture of ages, meaning someone’s bound to be home when you come knocking. Try the Third and Coffman area up to Sunset. Definitely check streets around Roosevelt Park. In the past, police officers have driven around the area and stopped to give kids candy. Prospect calls itself a “town,” but it’s actually a quirky, brightly colored, new urbanist-style neighborhood in south Longmont, near Pike Road and U.S. 287. And it does Halloween like nowhere else in Boulder County. So many houses decorate to the extreme, and since they’re all close together, it creates a feeling of an entire haunted village. Many houses here do the treats big, too. Literally. You may score full-sized candy bars, old-school style. Prospect gets pretty busy after dark, so head there before sunset, when the good candy is still available. 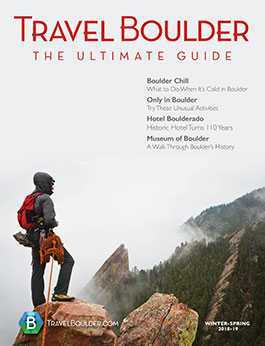 This area in northeast Boulder gets pretty packed, too. In the past, we’ve seen fun decorations and great candy. One place even has ignited a huge bonfire nearby, which adds to the mood. Downtowns are usually a good bet if you’re not sure where to go, and Louisville is no exception. The shops, as well as the historic houses, go nuts with decorations. Explore Vista Lane and West Mulberry. You won’t need to trek far before your goodie bag is overflowing. Yup, another old town area, where houses are close together and easy to navigate. Add in the scattering of shops, many of which get in the spirit, and you won’t be disappointed. 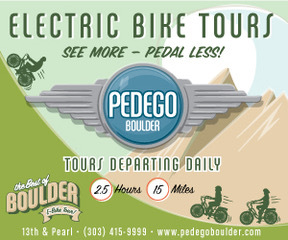 The small, east Boulder County town of Erie is basically a series of neighborhoods, so just drop a pin here and go. Erie Village has decorated well in the past and even set up a few haunted houses. Erie’s historic old town area is our favorite though. Expect to see some absolutely over-the-top decorations. The streets crawl with kids, and the candy runneth over. Plus, the town is named Erie. Could it be any more perfect?